The piano features centrally in Brahms's list of works. Not only did he create one of the great bodies of music in the solo keyboard literature, he also used the piano extensively in chamber music: in duos, trios, quartets and a magnificent quintet. Then there are the numerous songs, the works for piano duet, and the largest of them all, the two great concertos. In the later phase of his creative life, Brahms turned increasingly towards smaller forms when composing piano music. The beauty and nostalgic atmosphere found in many of these pieces is perhaps their most compelling characteristic but collectively, their range is wider. 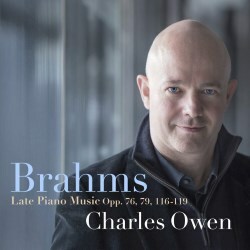 This beautifully produced 2CD set of the later piano works of Brahms confirms Charles Owen as a leading interpreter in this repertoire. As a collection, it makes great sense to gather the compositions in this way. They form a valuable survey of some of the greatest piano music of the century, offering so many insights into a unique and evolving personality. The Avie recording team has achieved excellent standards of balanced sound and sensitively presented piano tone, captured in the pleasing acoustic of the Menuhin Hall. While the majority of the pieces collected here were not necessarily intended to be played in sequence, but were gathered together for publication, it does make eminent sense to present them in this way. So, the listener and collector can find the music as and when intended, just as in locating an item in any library. The layout and presentation could hardly be clearer. Not all these compositions are what could be described as miniatures, in fact that description fits only uneasily with Brahms. Even at their lightest, as in much of Opus 76, there is something more substantial to be found. Owen captures just the right approach in presenting the personalities of these smaller pieces. He also has an imposing sense and vision of the scale of the two great Rhapsodies of Opus 79, which is more ambitious and wide-ranging, with the details of phrasing experienced for their longer-term implications as well as their short-term effects. The wonderfully subtle pianistic shadings and emotional sensitivities of Opp. 116, 117, 118 and 119 together form a substantial body of work, comprising some 75 minutes of music – not that they were ever intended to be performed together in sequence. In the later phase of his creative life, as mentioned above, Brahms turned increasingly towards smaller forms when composing piano music. The beauty and nostalgic atmosphere found in many of these pieces is perhaps their most compelling characteristic; but collectively, their range is wider. These characteristics can certainly be found in the collection of Fantasias that Brahms composed in 1892. In fact none of the seven pieces in the collection has this title; for they are described individually as either Capriccio or Intermezzo. Taken as a whole, there is variety as well as unity, as Owen's performances readily show. The Intermezzos rank among the most harmonically advanced of Brahms’s compositions, full of subtleties at every turn, while tending towards under-statement and delicacy. However, these performances reveal that in the Capriccios the mood can be stormier, as if in homage to Robert Schumann, whose piano music Brahms was editing in 1892. The most powerful of these pieces, representing a true finale therefore, is the Capriccio in D minor. Brahms described the three Intermezzi Opus 117 as ‘Wiegenlieder meiner Schmerzen’ ('Cradle Songs for my Sorrows') and they exude a special warmth and sensitivity that is beautifully captured in this recording, the tone set by the opening bars of No. 1 in E flat. In the Klavierstücke Opus 118 and 119, the range is wider. Owen immediately makes this apparent in the passionate mood of No. 1 in A minor, while the valediction expressed in No. 2 in A major is confirmed by a quotation from the composer's German Requiem. The Intermezzo in D minor, the sixth and last of the collection, begins amid dark, brooding and romantic heroism, but despite reaching towards a resonant climax, the music becomes increasingly pensive, fully justifying the description Largo e mesto (slow and sad). Owen's performance of this wonderful composition responds to Brahms's complex vision most imaginatively. Despite the range and subtleties of these piano compositions, it is somehow appropriate that Brahms chose that his final piano piece, the Rhapsody Opus 119 No. 4, should be an Allegro risoluto, grand in both scale and manner, as if determined to find a display of magnificence. As such it makes a fitting finale also to Charles Owen's splendid survey of the late piano music.